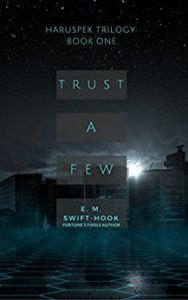 E.M. Swift-Hook’s TRUST A FEW is simply excellent writing. If you love science fiction with complex plotting, note-perfect world-building, and characters who are as flawed and complicated as everyone you meet in real life, then you must read this book. Every single character has a well-developed backstory (that is never belabored) and place in the convoluted machinations of a universe that is full of the same inequities of our world today, writ larger. While the characters struggle to balance their personal integrity against the demands of situations that challenge and insult those values, you really feel their dilemmas. How does one honor an old friend when they no longer know who they are? Who is a hero, and who is a terrorist or outlaw? How does one deal with a past one cannot recall? When does one have to stop thinking a person is a friend and decide they are an enemy—and vice versa? This is a continuation of Swift-Hook’s FORTUNE’S FOOLS series, but in no way do you need to read the previous books to be almost instantly immersed in the main action of TRUST A FEW. Do yourself a favor and start reading this immediately! Disclosure: I purchased this book.